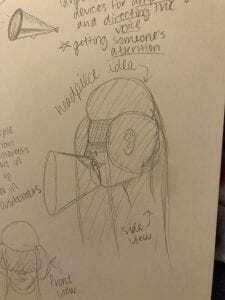 My first concept for personal space focuses on noise. While exploring Chinatown, I noticed that many vendors tried to draw in customers by talking to them as they walked by on the street. There were so many things going on that it was hard to just hear one thing at a time. 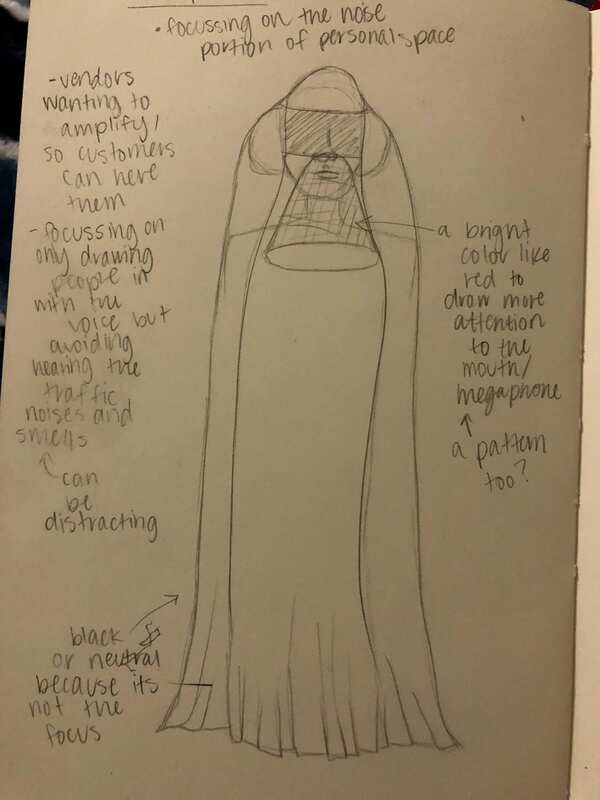 The garment I designed takes the idea of blocking out all of the surrounding sounds with a large wrap or”headphone” like structure, and it shields the eyes and nose from view. Instead, the main focal point is the megaphone that surrounds the mouth to amplify talking. This way there are no distractions from anything other than trying to persuade someone to buy something or to come into a shop. 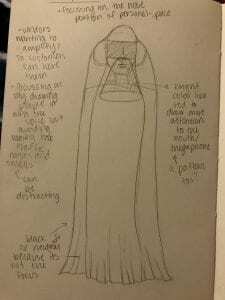 The headpiece would connect to the rest of the bodice, too, with all of it flowing together. 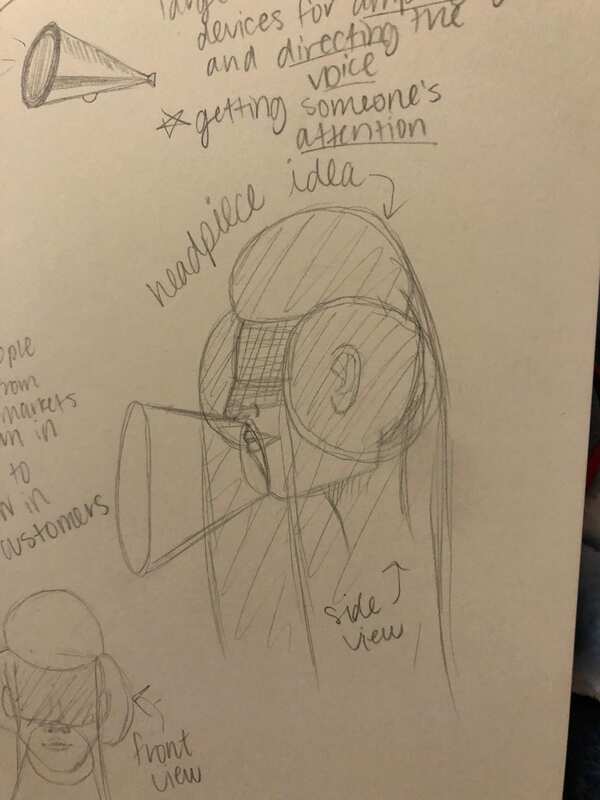 It would be a neutral color like black or grey, as not to distract from the megaphone/mouth area. The mouthpiece would be a bright red with a pattern, standing out against the rest of the garment even more since red is the color most people notice first. 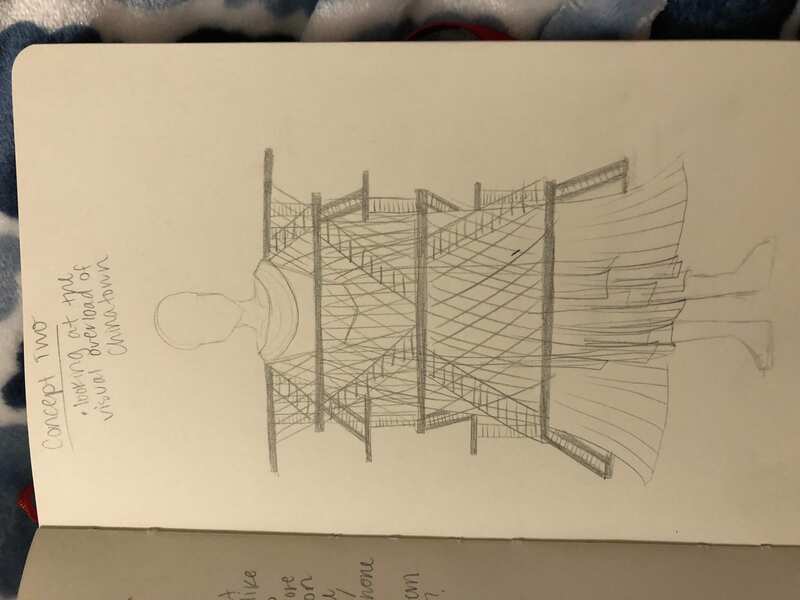 My second concept focuses on the visual overload one experiences in Chinatown. As I walked through, I saw that there was a lack of extra space anywhere on the streets. Each vendor’s items lined up with the next vendor’s. This was similar in the architecture in the buildings, too. Everything above seemed almost squished together when I looked at it, especially the fire escapes/ladders/stairs. With the garment I designed, I tried to highlight how close together everything is in Chinatown, but also have a lot going on. 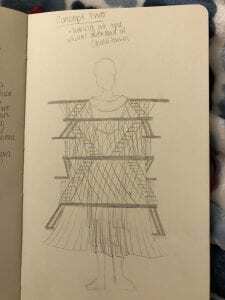 There would be pieces from the back of the garment that connect across to the front pieces like stairs and ladders, along with lots of extra thread and patterns to distract the eye. I would want someone who is viewing it to almost not know where to look, partially for lack of space left and also for all of the different textures and things going on within the piece.